The Color Run Is About to Hit Tampa! In November I mentioned that I’m running The Color Run with my kids this year. Only a few days left! My son was excited, then decided he didn’t like running, then became excited all over again and not only is running with me outside, he also is running on the treadmill some nights. I couldn’t be happier about how this is motivating him and his sister to take up running. It must really be the happiest 5K on the planet, since I’m already happy! 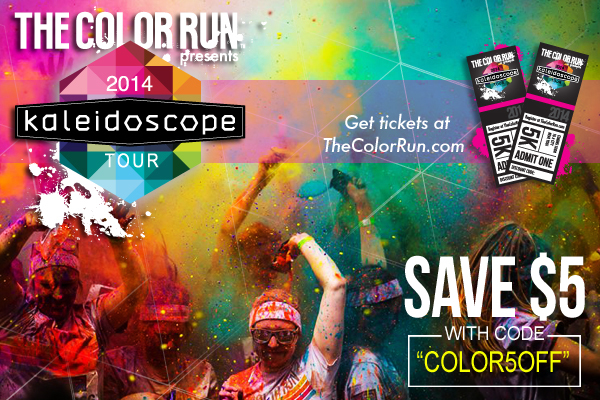 This year The Color Run is going all Kaleidoscope-al. What does that even mean you say? Well. That’s super groovy and all, but what about the race course you ask. Well. Awesome Kaleidoscope fun at the finish festival! Anyways, my Children of the Corn are running it and I think you and yours should too! When you sign up don’t forget to use the code Color5Off when you register (it can’t be applied later) for a $5 discount to sign up for a run in any city and if you sign up as part of a team of 4 or more you get an additional $5 off per person. This code is not valid on flash city sales. Need a little more incentive to join us? How about a chance to win a free entry? Just leave me a comment below letting me know what city you’d run in and you’ll be entered, the winner will be chose at random Monday and announced here on the blog next Tuesday. Have you ever run a 5K? If you have kids do they ever run with you? Disclosure: I have received a race entry in exchange for posting about The Color Run. This entry was posted in Discount Code, giveaway, Running and tagged Tampa, The Color Run by Kinda Zennish. Bookmark the permalink. Thanks for the information about the race. I can’t wait to hear about your adventure! Sounds like a lot of fun. My first 5K of the year is in February and I’m running with my son. Fun! I love running with my kids. I bring my 20 year old to mud runs and my younger two are going to try The Color Run! I would like to run the color run in Columbus, OH. I need to do this run, I need to get out and see what all the hype is about!! I need to get back in shape for my five kids and be able to be around for a long time. This colorful fun event is exactly what we need to bring our family together and begin a new energetic and healthy lifestyle. We look forward to seeing you all there. !